Laura Gilbert__ Art Unwashed: "Mantegna to Matisse: Master Drawings from the Courtauld Gallery" at the Frick; Can An Abundance of Greatness Ever Be Too Much of a Grand Thing? 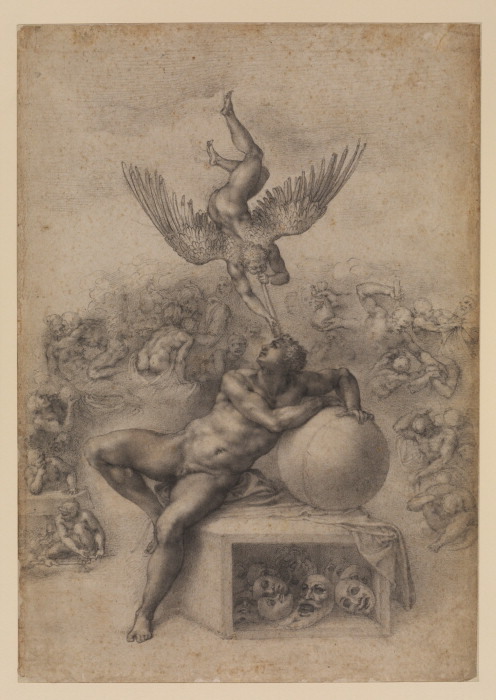 "Mantegna to Matisse: Master Drawings from the Courtauld Gallery" at the Frick; Can An Abundance of Greatness Ever Be Too Much of a Grand Thing? Who can take issue with a surplus of the sublime, even if it's contained in two small rooms in the Frick's shoebox of a basement and a tiny room on the street-level floor? It's a relatively small show of drawings by Michelangelo, Durer, Rembrandt, Rubens, Ingres -- and that's just the beginning of the cornucopia of great artists represented in 58 works on loan from London's Courtauld Gallery. That's not to ignore Bernini, Canaletto, Watteau, or Fragonard -- they're here too. As are Goya, van Gogh, and Manet. It's like a ten-pound box of chocolate truffles -- way too many sweets to savor in a single sitting. As might be expected in a show that covers art from the late Middle Ages to the early 20th century, the styles and purposes of the drawings are all over the place. 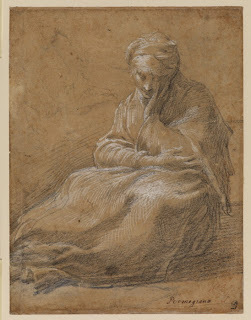 There are Leonardo's scribbled studies of Mary Magdalene, Pieter Breugel the Elder's detailed line drawing of a peasant scene that would be used to make a print, and a watercolor by Cezanne meant as a finished piece. Rembrandt's drawings here are a quick visual record of whatever interested him. Parmigianino seemed to pick up the chalk because he liked a woman's pose. Goya's drawing inhabits his private world of witches and demons. Mantegna struggled to get the posture of Christ just right and used both sides of the same sheet. Then there are the works significant as part of art history: The Dream by Michelangelo, one of the first drawings conceived as an independent work of art; one of the earliest Italian landscape drawings, by Fra Bartolomeo (ca. 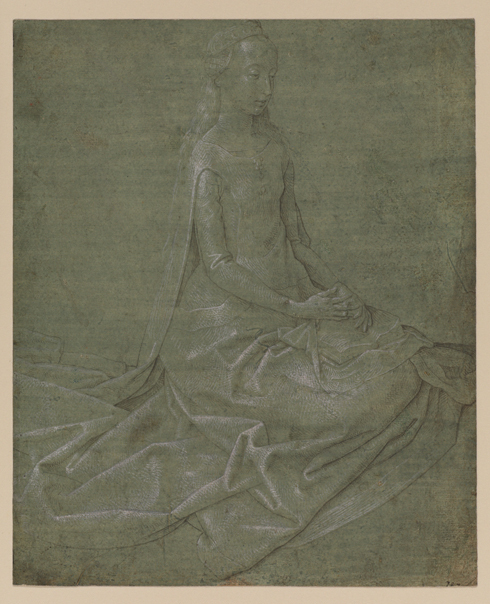 1505-09); and the extremely rare, delicate pen and ink drawing of a saint from the workshop of the Flemish artist Hugo van der Goes (ca. 1475-85). There's not much context to learn about a particular artist or a period of art or a technique. Exceptionally high quality is the glue that holds the show together. So this is an exhibit that presents art as pretty much ahistorical and at its most fundamental -- pure visual pleasure, of which there is plenty. A few drawings stand out, even amid this elite group. 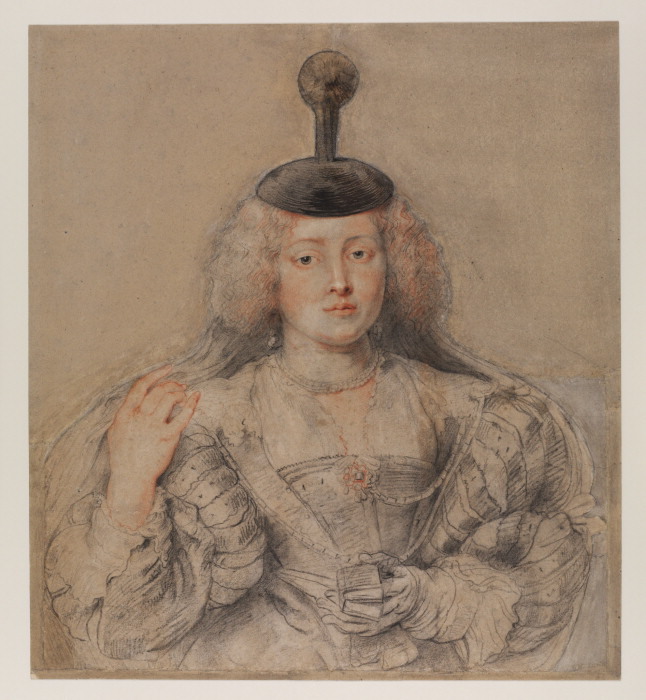 Rubens, Portrait of Helena Fourment, ca. 1630-31 (top). Rubens' drawings of his family are among the greatest drawings in the history of Western art, and this portrait of his young second wife is sublime. The viewer sees a sensual woman revealing herself -- lifting her veil to reveal soft skin; even the sleeve of her dress falling ever so slightly around her wrist is sensual -- but she herself is modest, seemingly unaware of her effect on the viewer, her husband. A love letter without words. Michelangelo, The Dream, ca. 1533. The Dream is always described as "enigmatic." A man is surrounded by figures that seem to illustrate the seven deadly sins, but who is he and what's he dreaming about? Like much of Michelangelo's work, the drawing celebrates the male body -- here, in a sexual way, with the legs spread wide open. It's thought to have been made for a Roman nobleman the artist was passionately in love with, Tomasso de' Cavalieri. 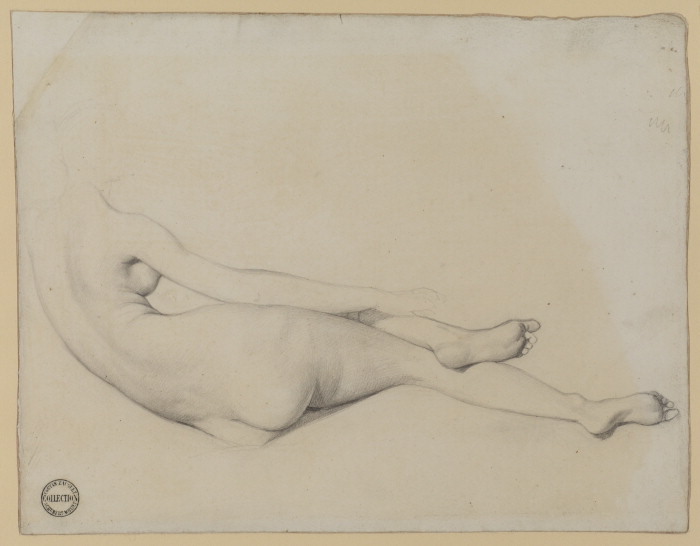 Ingres, Study for La Grande Odalisque, 1814 (below). Ingres always knew how to concentrate the eye. In his portrait drawings anything other than the face and hands -- the most expressive parts of the body -- might as well not exist. Here his sensuous line, which modern masters like Picasso and Matisse were smitten with, focuses on the breast and buttocks, although one rarely thinks of the cool Ingres as a T&A man. 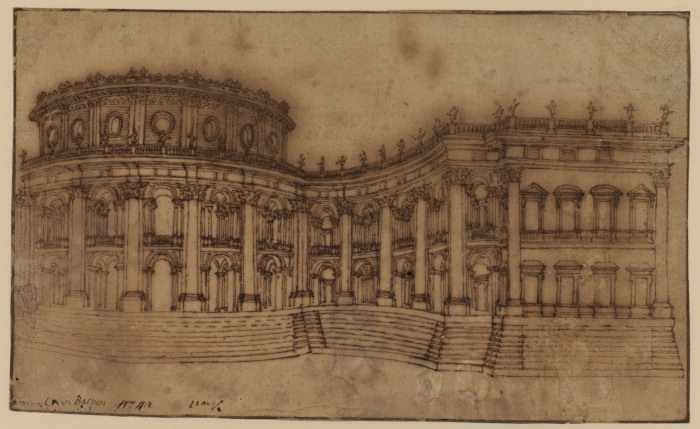 Bernini, Design for East Wing of the Louvre, 1664 (above). Bernini had an international reputation, not just as a sculptor but as an architect as well, and he was asked by the French government to submit a design for the Louvre. Like his sculpture, his architecture animates the space around it. This design, with its exuberant bulge, was rejected in favor of Claude Perrault's flat and boring facade. 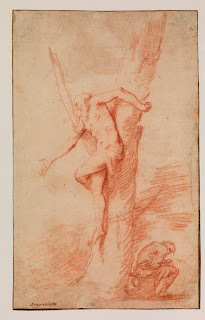 Ribera, Man Tied to a Tree, ca. 1630-35. 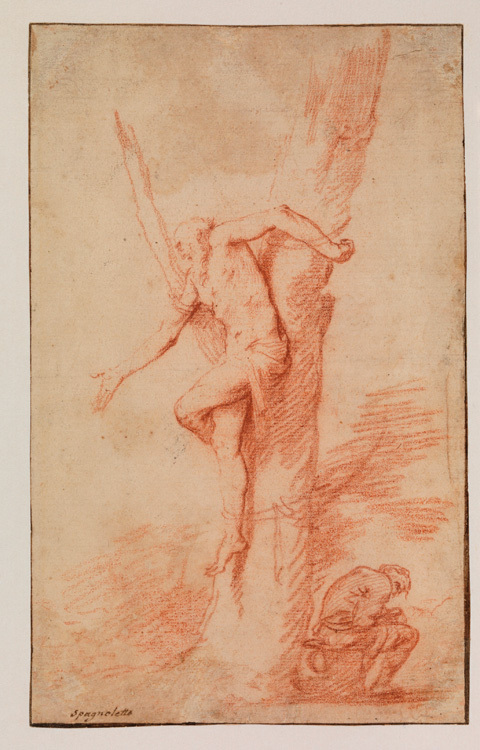 In this brutal red-chalk drawing, an old man is tied to a tree, helplessly reaching out, and another man is seated, perhaps in despair. It's not known what provoked this drawing, what its purpose was, or what it means, but it's gripping, disturbing, and beautiful. 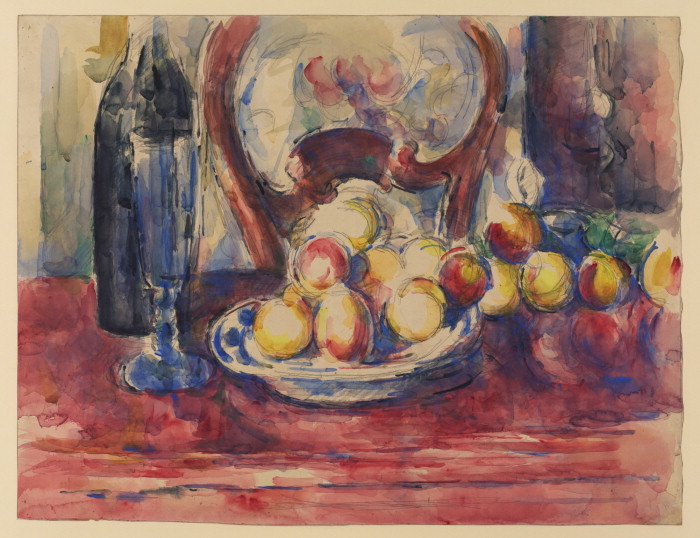 Cezanne, Apples, Bottle, and Chairback, ca. 1904-06 (below). This watercolor painted at the end of Cezanne's life has everything admired in his paintings -- things are slightly off kilter, the table is impossibly tilted forward, the outlines make no sense, yet the painting hangs together as a wonderful whole, full of tension and visual incident. "Mantegna to Matisse: Master Drawings from the Courtauld Gallery," Frick Museum, 70th Street at Fifth Avenue, through January 23, 2013. Images from the Courtauld Gallery website.